Nick Pynn’s set-up resembles a slightly madcap music shop. An array of stringed instruments hang from their stands, some conventional, others more esoteric. One such instrument is the cocolele, a ukulele fashioned from a coconut shell. Pynn plays it with a slide, picking out a jaunty blues suggestive of John Fahey at 45rpm. He dazzles on a ‘lopsided’ dulcimer, adding some almost dissonant voicings to its Appalachian stream of sound. Most pieces see him playing several instruments, looping and layering guitar, mandola and fiddle into graceful chamber folk pieces. His fiddle and viola pieces, such as ‘Michigan Sleeping’, stand out, blending folky melodies with minimalist repetition. It’s reminiscent of Penguin Cafe Orchestra at times, and Pynn shares something of that group’s gentle English eccentricism, incorporating unusual sounds into his acoustic arrangements. His ‘guests’ include The Crystal Sisters, four tuned wine glasses whose otherworldy tones he loops into a celestial chorus, the sampled voice of Shetland singer Astrid Williamson, and the ethereal Uma Theremin. Quirky composition methods, such as writing a melody in morse code, and creating a tune from words, produce delightfully off-kilter results. This playful approach, combined with his considerable instrumental and compositional skills, creates a rough magic. Inlingua Edinburgh, 220 5119, until 28 Aug, 9.15pm, £10 (£8.50); also Kate Daisy Grant with Nick Pynn, Fingers Piano Bar, 225 3026, until 27 Aug (not 15, 22), 6.40pm, free. Multi award-winner delights us again with original compositions on stringed instruments and found items. 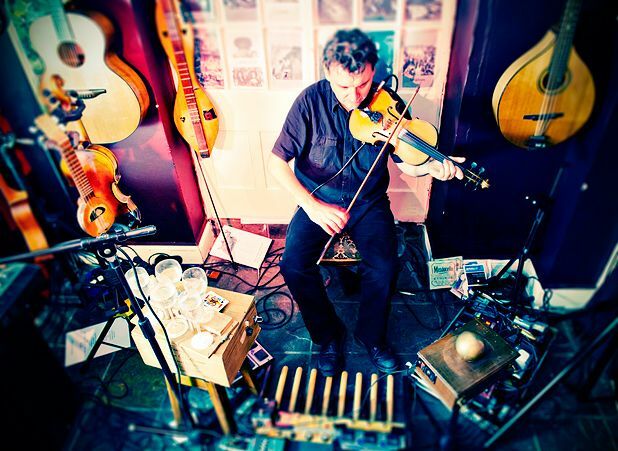 Nick Pynn is a maverick electro-acoustic ‘player tunewriter’ who performs on violin, mandocello, steel-string guitar, lap dulcimer, 5-string banjo and wine glasses, whilst live-looping and bass-pedalling with his feet.